A blog dedicated to paleo-linguistics, with a focus on the etymological survey of the English and Indo-European languages. Tyrsenian is a closely-related language micro-family proposed by Helmut Rix (1998), that consists of the extinct Etruscan language of central Italy, the extinct Raetic language of the Alps, and the extinct Lemnian language attested in the Aegean Sea. Ever since Antiquity the origin of the Etruscans has been a matter of controversy. 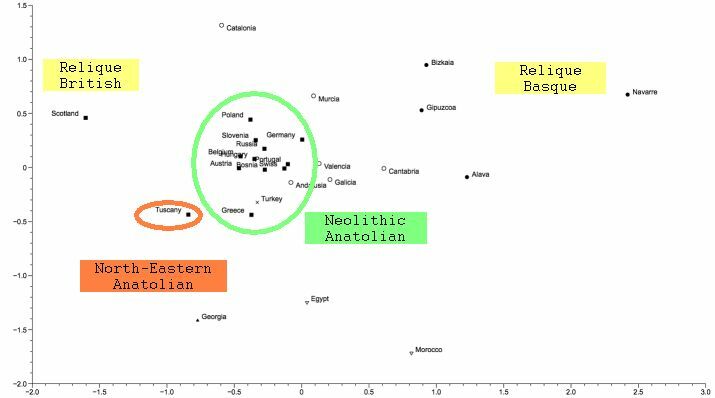 Are they autochthonous or did they come from somewhere else, from the Near-East or Anatolia? The paper contains a figure where (peri)-Europeans are contrasted. The article is designed to underline the specific position of Basque people. It also emphasizes that the results undermine the idea of a “Vasco-Caucasic” special relationship. Another point that the article indirectly shows is that from the genetic point of view Tuscany should be located in the vicinity of Greece, Turkey and Georgia out of Europe proper. This provides considerable support in favor of non-autochthonicity. From a linguistic point of view Etruscan (and its close dialects Rhaetic and Camunic) is an evolved variety of Hurro-Urartean. Because Hurrian is better attested than Urartean it is easier to compare Etruscan with Hurrian but Etruscan shares more features with Urartean. In particular Etruscan had a strong stress which causes numerous vowels to mute out, especially initial vowels. Urartean had a strong stress on penultimate syllables and this prosodic feature also accounts for the specific developments observable in (Proto)-Armenian. Among other words: Hurrian nibashuri ‘liver’ ~ Etruscan nethśrac ‘haruspicina’ (B-B 2002:217), netśvis ‘haruspex’ (B-B 2002:217). Phonetics is a bit confused [t(h) ~ b] but the connection is obvious. The root is itself PIE *libh- ‘liver’, whence English liver.